Cooking outdoors has become more of a regular activity. 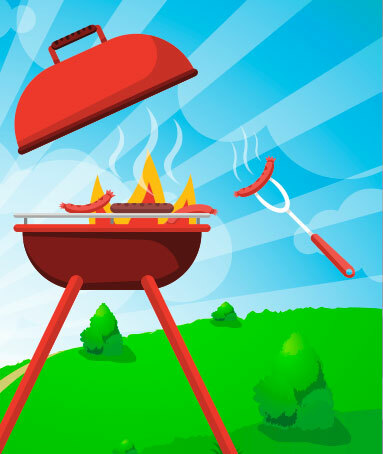 Barbecue is the most popular form of outdoor cooking among Americans. No matter what the occasion is we just love to barbeque. Here are some tips on how we can safely cook our food without causing any food borne disease. Meat and poultry can be marinated for several hours or days to tenderize or add flavor. Be sure to marinate food in the refrigerator, not on the counter. If some of the marinade is to be used as a sauce on the cooked food, reserve a portion of the marinade before putting raw meat and poultry in it. However, if the marinade used on raw meat or poultry is to be reused, make sure to let it come to a boil first to destroy any harmful bacteria. When carrying food to another location, keep it cold to minimize bacterial growth. Use an insulated cooler with sufficient ice or ice packs to keep the food at 40° F or below. Pack food right from the refrigerator into the cooler immediately before leaving home. Keep the cooler in the coolest part of the car. When using a cooler, keep it out of the direct sun by placing it in the shade or shelter. Avoid opening the lid too often, which lets cold air out and warm air in. Pack beverages in one cooler & perishables in a separate cooler. Be sure there are plenty of clean utensils and platters. To prevent food-borne illness, don't use the same platter and utensils for raw and cooked meat and poultry. Harmful bacteria present in raw meat and poultry and their juices can contaminate safely cooked food. Cook food to a safe internal temperature to destroy harmful bacteria. Meat and poultry cooked on a grill often browns very fast on the outside. Use a food thermometer to be sure the food has reached a safe internal temperature. Whole poultry should reach 180° F; breasts, 170° F. Hamburgers made of ground beef should reach 160° F; ground poultry, 165° F. Beef, veal, and lamb steaks, roasts and chops can be cooked to 145° F. All cuts of pork should reach 160° F. NEVER partially grill meat or poultry and finish cooking later. After cooking meat and poultry on the grill, keep it hot until served -- at 140° F or warmer. Keep cooked meats hot by setting them to the side of the grill rack, not directly over the coals where they could overcook. At home, the cooked meat can be kept hot in a warm oven (approximately 200° F), in a chafing dish or slow cooker, or on a warming tray. Smoking is done much more slowly than grilling, so less tender meats benefit from this method, and a natural smoke flavoring permeates the meat. The temperature in the smoker should be maintained at 250° F to 300° F for safety. Use a food thermometer to be sure the food has reached a safe internal temperature. Cooking may require 10 to 12 hours or more it's difficult to estimate. A meat thermometer must be used to determine the meat's safety and how much it is cooked. There are many variables such as outdoor temperature, the size and thickness of the meat, and how fast the coals are cooking. Take garlic, olive oil, tomato sauce and red wine vinegar and blend them together in a large bowl. Season with salt, basil and cayenne pepper before adding shrimp to the large bowl. Continue stirring until evenly coated. Use a lid to cover before placing it on the shelf of a refrigerator for 30 minutes to 1 hour. Don’t forget to stir it once in a while. Grill has to be preheated on medium heat. Thread shrimp onto the skewer. Discard marinade after piercing near the tail once and once near the head as well. Evenly and lightly oil grill grate. Both the sides of the shrimp have to be cooked on a preheated grill for 2 to 3 minutes or until opaque. Put the combination of onion, garlic and whiskey in a large skillet. To make onion translucent, simmer the mixture approximately for 10 minutes. Add the tomato paste, ground black sauce, ketchup, salt, liquid smoke, vinegar, brown sugar, hot pepper sauce and Worcestershire sauce to the mixture. Simmer for another 20 minutes reducing the heat to medium-low. People who prefer a smooth sauce, they can run sauce through a strainer. Take a bowl and place chicken and 1 cup salad dressing in it. Before marinating it for 3 hours in a refrigerator, you have to cover it. Evenly and lightly oil the grill grate. To marinate discard the dressing. Both the sides of the chicken have to be grilled for 7 minutes or until juices run clear. Keep it aside for cooling it. Slice it. Cooked chicken, sun-dried tomatoes, spinach and remaining dressing have to be blended in a large bowl. Focaccia bread has to be brushed with olive oil. You have to cook both the sides for 1 minute on the prepared grill or until lightly toasted. To serve, place pieces of the chicken combination on a toasted focaccia. The barbecue plate has to be heated on medium heat. Roughly chop the fish placing it in a food processor. Add parsley and nuts to the chopped fish and blend them. Mix onion, breadcrumbs, egg, parmesan and capers properly before adding them to the fish mixture. Season with salt and pepper and continue stirring. Place the fish mixture 9 (1/4 cup mixture at a time) into 12 patties. Spray oil properly on both the sides of the fish patties. Each side has to be barbecued thoroughly for 3 to 4 minutes or until cooked. Serve these patties along with salad leaves and tomato chutney.